This was one of Long Island’s most popular drive in theaters because it was right over the city line. Cars would line up for miles to see first run double and sometimes triple features. It was the first drive-in theatre to open in New York State, opening on August 10, 1938 with Jimmy Durante in “Start Cheering”. 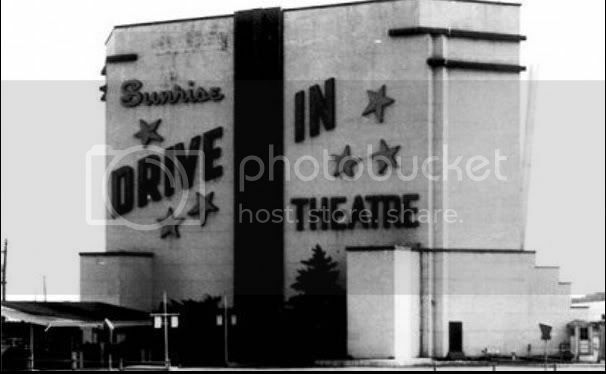 The Sunrise Drive-In later had a huge curved screen and the side that faced the street was covered in gaudy neon. It also had a big play park and concession stand. By 1955 it was being operated by Michael Redstone. The Sunrise Drive-In was closed and torn down in 1979, when Redstone built the Sunrise multiplex. 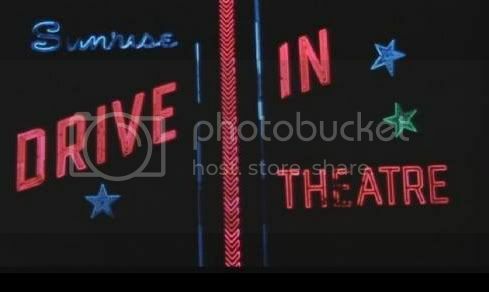 Although I grew up not far from Valley Stream, we didn’t do the drive-in much…but how I remember the few times we did! “King Kong” (the 1976 version); a double bill of “Grizzly” and “Day of the Animals”, and best of all, a double-bill of “Star Wars” (the 1977 original, which was still in its original release at this time) and the 1953 version of “War of the Worlds”! I never did find out how they came up with that combo, but who cares! Seeing the Martian War Machines on that big, big screen was awesome! That last image of the opening day ad is most likely the same one from the Long Island Press that Warren posted back on November 14, 2007. I find that little mailer from the 1950’s to be interesting. I suppose with the competition from television, the folks at Sunrise took their advertising campaign door to door via the USPS. I wonder if the Sunrise ever really ran a true VistaVision presentation? Introductory comments up top might be updated to reflect exact opening date of August 10, 1938, and correct time of closure and demolition to 1979, sometime after the run of “The Exorcist” re-release as detailed above by KingBiscuits on January 16, 2010.
enjoyed some of the great stories,especially the one about car-speakers. I remember seeing “Night of the living Dead” there. Had to be 1969. Also “Rocky”, “Let’s scare Jessica to death”, The Planet of the Apes. and “The new Centurions”. I believe my brother may have hidden in the trunk one time to reduce costs. Had a nice Playground there for us kiddies. That theater was featured in the Movie “The Lords of Flatbush” and I would not be surprised if it was actually shown there as well. Then they had the Flea Market there also. Pic of the dive-in site today in photos. August 16, 1938 photo added with caption. 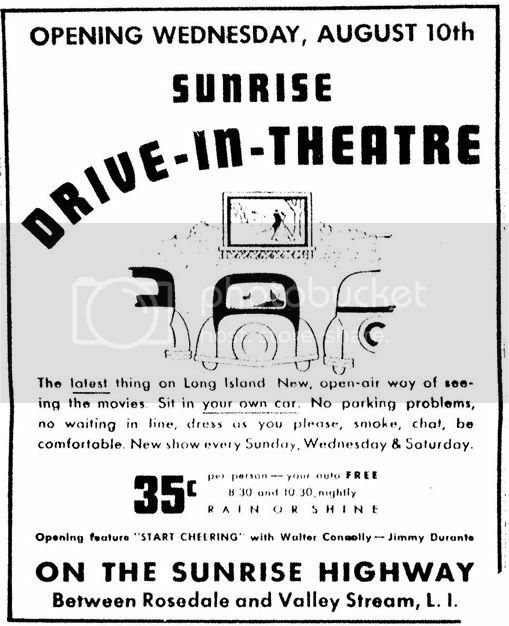 Just added another 8/16/38 photo front & back, which states that the Sunrise was “New York State’s first open air drive-in theater”. Something that should likely be added to the Overview.